The Gold Power Link will suit any 9 speed Sram chain. It's an essential spare! High quality essential trail accessory. These bad boys have got me out of more stranded-15-miles-from-home situations than anything else. Fit with no tools, remove with no tools. They're amazing. Vital to have these life savers in your kit. Saved me a long walk several times. Essential trail kit and allow easy chain removal for cleaning, so no risk of degreaser getting into hub bearings etc. Quick and easy to use but still pack a chain tool to remove a broken link if you plan to use as a repair on the trail. Never leave home without one...or two. Having been the victim of a couple of snapped chains of late on both bikes, I thought I'd better stock up again on the necessary and Merlin is the only place I can depend on for a reliable delivery date, cheers. Bought in case of emergency. Have not had to use yet, and hopefully will not have to! Looks a nicely made quality item. Essential spare part. So ridiculously simple to use and brilliant. Since discovering them, I have always carried a couple in my tool kit. Super easy to install by hand, cheap enough to carry a couple of spares in the saddle bag. Quick delivery. 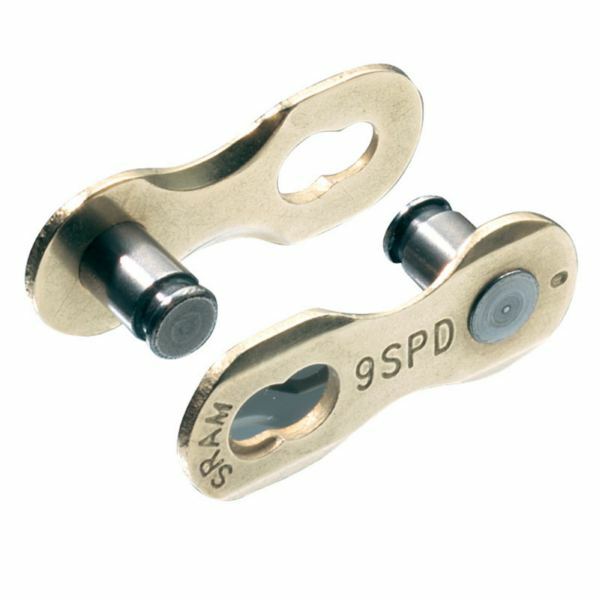 I use these with shimano HG53 and sometimes lighter shimano chains if they are on special offer. I have never encountered a problem in 3000+ miles and they are easy to release unlike some other brands I have used. Make cleaning the chain so much easier. Easy chain on-off for fiting, maintenance and trail side repair. Always good to have a couple of these stashed away in your pack to be safe in the knowledge you'll get home if yor chain snaps in the middle of nowhere. I've dished a few out dring the Strathpuffer too! Have used these in the past on a shimano chain, quick and easy to fit. Really saved my bacon! Strong and easy to use. Essential extra to your ride kit!! Bought to replace my tired old generic link - stopped my chain jumping around nicely! These links were purchased for spares to be carried when i am out on the bike,so far i have not had to use them.They were recommended to me by a friend who has used them in the past..Merlin are always very competitive on price and i find the delivery service outstanding. Looks like just thing thing for a broken 9-speed chain. Hope it works when I need it to!!! Very handy, and easy to spot on the bike. Can't fault it really. Easy to use and the gold looks great and is easier to find on your chain! never let you down put one on and forget about it. Makes chain disassembly a doddle for cleaning purposes just squeeze and push together simple! and I've been using them on shimano chains with no proplems for years come on shimano less of this pin only nonsence. Great to keep in your repair kit for those broken chain proplems on the trail to, what's not to like. Good product, met expectations. Would order again. Great service from Merlin. very useful on my new chain. An indispensable part of any cyclist's tool kit. Never leave home without it. It also makes chain cleaning a doddle, which is nice. These links make for easy fitting and removal of the chain for any cleaning or maintenance. Had one on my mountain bike for 3yrs with no issues. Now on my other two bikes Just make sure you buy for the correct speed. Useful piece of kit. Quickest way to fix a snapped chain on the trail.